Just how much water is there on Earth? Earth is unique because it has so much water. It’s in the ground, on the surface, in the air and in our bodies. About 71% of Earth’s surface is water. If you took all the water on Earth and put it into a ball, it would be about 860 miles wide. Where is that water located? Is it saltwater or freshwater? 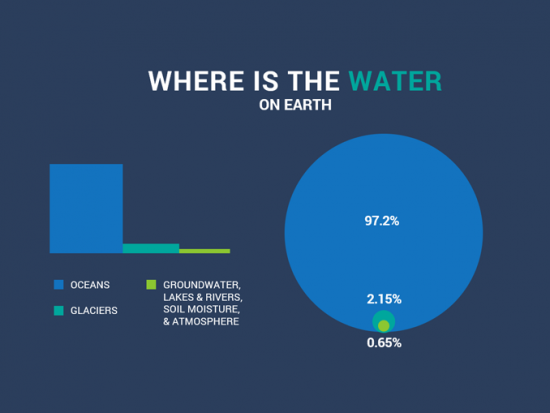 How much water is in glaciers, groundwater, rivers and lakes? Let’s take a look at some of the interesting facts about the global water distribution and volume on Earth. The Earth holds about 326 million trillion gallons (326,000,000,000,000,000,000 gallons) of water. If you crunch the numbers, here’s the percentage in global water distribution of all these sources of water. The table is a rough approximation of global water distribution as some water in the atmosphere as water vapor, permafrost and biological water. Read more about each source of fresh and saline water and their trends in global water distribution. Most of Earth is salt water in oceans. About 97.2% of Earth’s surface water resides in oceans. 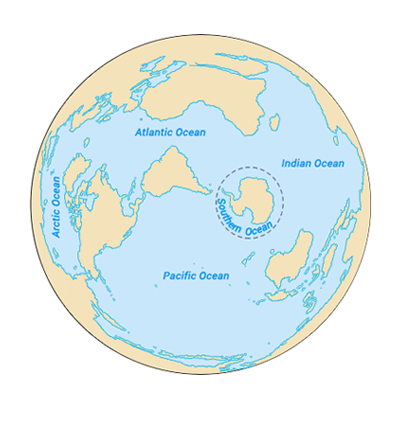 There are 5 oceans that surround continents. The average depth of oceans is 2.7 kilometers so water volume is about 1,338,000,000 cubic kilometers. 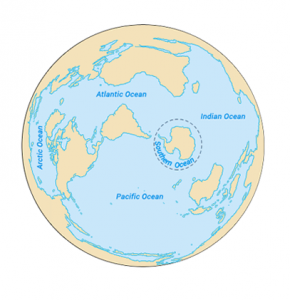 Oceans are foundation of water cycle. Water moves continuously in nature in three stages: evaporation, condensation and surface runoff. Ocean currents are like giant conveyor belts moving huge amounts of water all the time. About 2.1% of Earth’s water is in glaciers. Glaciers are the second largest reservoir of water with most of them in Greenland and Antarctica. Currently, glaciers store about 24,060,000 cubic kilometers of water. Glaciers fluctuate in water availability the most with ice ages and global warming. As temperatures surge, sea levels rise with it. This is because melting ice sheets and glaciers add to total water volume. Scientists estimate sea level will rise 32 to 68 inches by 2100. This rise in sea levels could swallow parts of coastal cities like Shanghai, Olympia and New York. As a hidden source of water, we find groundwater everywhere. About 0.65% of the water on Earth is in groundwater stored in an aquifer. There’s two types of groundwater – saline and fresh water from groundwater. Fresh groundwater makes up about 45% of water in the ground. Whereas saline groundwater is about 55%. Groundwater has more than 100 times the amount of freshwater than lakes and streams combined. In addition, groundwater is hard to get out of the ground, slow to recharge and is easily contaminated. That’s why groundwater is a delicate resource that we use as a rainy day fund and draw in times of need. Only 0.009% of water is stored in lakes. For example, the Great Lakes are sources of freshwater which consists of about 21% of freshwater lakes on Earth. Lake Baikal in Russia stores approximately the equivalent of all 5 great lakes. Even though rain water washes minerals and salts into rivers and lakes, they are mostly freshwater. This is because their minerals get washed away and transported to an outlet at the nearest ocean. So unlike salty oceans, lakes and rivers constantly have the minerals washed away. Saline lakes are landlocked bodies of water with a high concentration of salt (NaCl). Evaporation is the only way water to exits from saline lakes. Saline lakes like the Caspian and Dead Seas only contain about 0.008% of Earth’s water. 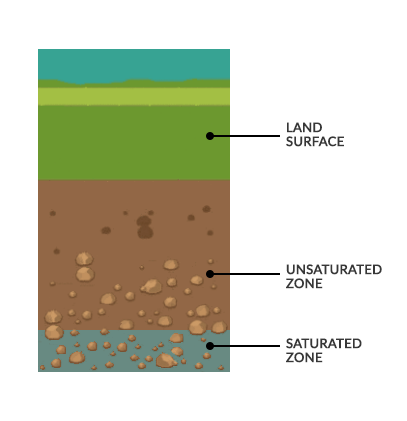 Next, soil is the upper-most layer which supports plant growth and agriculture. Soil moisture has only 0.005% of the global water distribution. Soils are about half minerals, half-open space – all within the top few centimeters of the surface. It’s often mixed with organic material, sometimes called humus. Soil texture describes particle size. 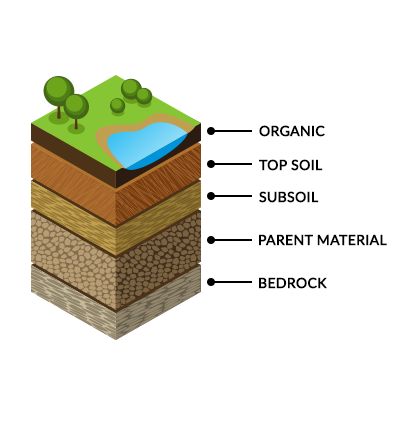 For soil, it consists of sand, silt and clay. Sand is the largest in particle size. Silt is just sand, but smaller. Finally, clay has even smaller particles than silt. Almost insignificant, streams, wetlands and swamps hold only 0.001%. Finally, only 0.001% of water is in the form of vapor within the atmosphere or in living plants and animals. For streams, everything upstream ends up downstream. 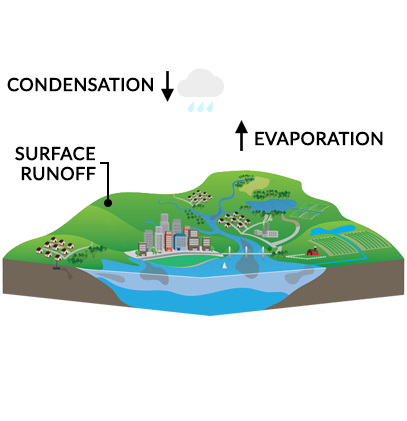 Within a watershed, well-connected networks of tributaries catch precipitation in a watershed or catchment basin. They zig-zag all the way to a main body of water like a river or lake. Wetlands are depressions on the land surface usually characteristic of specific vegetation. These types of habitats lay the foundation for biological diversity and resilient ecosystems. If you compare salt water vs freshwater, about 97.2% is not suitable for drinking because it has salt in it. If we sum up all the sources of freshwater, about 2.8% of water on Earth is freshwater. Of that 2.8%, 99% of freshwater sources is either from glaciers or in an aquifer contained as groundwater. Just a minuscule amount (1%) are in freshwater lakes, streams and in the atmosphere. Glaciers store approximately 3/4 of Earth’s freshwater. This makes glaciers the largest reservoir of freshwater on Earth. Finally, groundwater is the second largest reservoir of freshwater on Earth. Groundwater varies on location. Fresh groundwater makes up about 45% of water in the ground. Whereas saline groundwater is about 55%.